1066 And All That. He was a prolific writer and published several humorous poetry books including his Collected Green Fingers series that were highly popular amongst gardeners and the general public during the 30s and 40s. 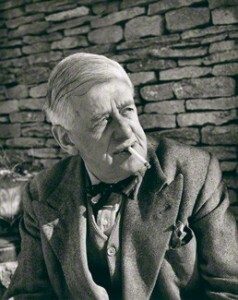 Arkell was brought up in Lechdale and went to Burford Grammar School where he discovered his interest in writing and decided to become a journalist. He published his first work, a children’s poem titled The Holidays, in the magazine The Captain in 1910. After marrying the actress Elizabeth Evans in 1912, his life was interrupted, as so many were, when the First World War broke out and he immediately enlisted. Arkell served in the Yorkshire Light Infantry and wrote the poetry collection All the Rumours at this time. On his safe return from the war, he began writing comedic plays such as The Tragedy of Mr Punch and The Last Waltz many of which proved popular with the theater goers of London. His most successful play was the adaptation of the popular 1066 And All That in 1936 which was later made into a film. Arkell became a keen gardener and this love of all things horticultural often spilled over into his writing. He created one of the most memorable comedic literary characters in Old Herbaceous and wrote many volumes of poetry such as Green Fingers and Other Poems and Green Fingers Again. Arkell’s career moved to film and television in the 40s and 50s and he penned the scripts for a number of series, working right up until his death. Arkell’s poems are noted for their simplicity and humor and his work often appears in anthologies today including The Everyman Book of Light Verse. Primarily known for his gentle wit and his irascible characters, Arkell died in 1959 at the age of 77.